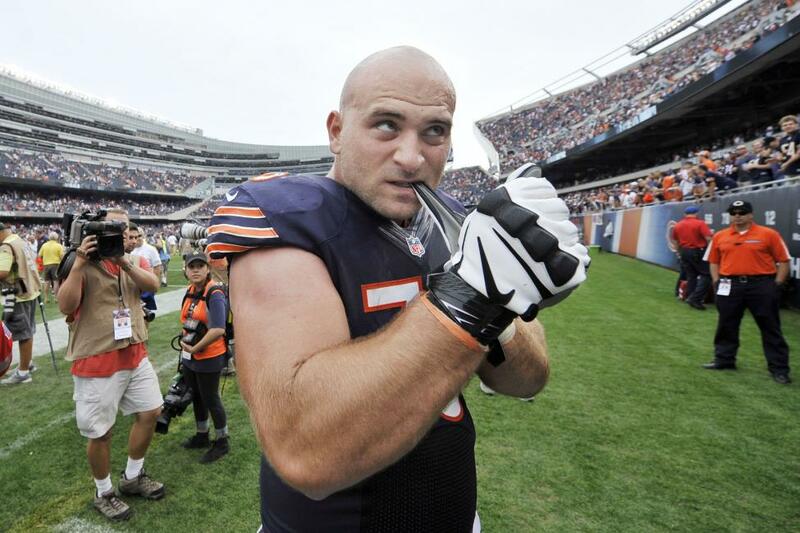 The possibility of playing the rest of the season without their offensive-line leader confronts the Chicago Bears as they wade through the medical reports about guard Kyle Long. Long's right foot was injured near the end of Sunday's 24-10 win over the New York Jets when teammate Dion Sims rolled up on his leg at the end of a play while blocking. On Monday, the team said another day or so of medical exams was needed before a prognosis could be made. Long was helped off the field Sunday, and later he had a boot on the foot and was using crutches to move around the locker room. "Right now we're hoping that it's good news," Bears head coach Matt Nagy said Monday at Halas Hall. "But we won't know here for a little bit. But when we do find that out, then we've got to deal with it either way. But for him, he's just got to stay mentally strong as much as he can." Nagy hasn't known Long for an extended period, but in the brief time has come to respect what he means as an offensive leader. "Since our first day together in OTAs, he's been a constant leader," Nagy said. "He's very engaged in meetings. He's just really done things the right way." The rough part for Long came before Nagy came to Chicago. In 2016 he suffered a severe right ankle injury when fullback Paul Lasike rolled up on his leg. Long had extensive surgery, and then had more surgery for a labrum injury and also for a hand injury. "You always feel for the person, whoever it is, however it happens because you put yourself in their situation," Nagy said. "A guy like Sam Acho (injured reserve, torn pectoral muscle), you know, he's a great leader and great player and it hurts to not be a part of it on the field. But as a coach you've gotta keep rolling, no matter what happens." While Nagy couldn't offer more in terms of news about the severity of the injury, he did admit it could mean Long's season is over. "I guess he could be, but I'm not sure," Nagy said. "It's one of those ones it could be a little bit of time, but I don't know if it's necessarily season-ending." Nagy said this isn't an aggravation of the old ankle injury, but is a separate foot injury. The options facing the Bears at this point include moving Eric Kush into the lineup if he's healthy. Kush and James Daniels had split snaps at left guard, but Kush sat out Sunday's win with a neck injury, which has been a problem for three weeks. Nagy said Kush is expected back this week. Another option is Bryan Witzmann, an offensive lineman who played in Nagy's offensive system last season in Kansas City, but was cut by the Chiefs just before this season. He was later signed and then cut by the Vikings before signing with the Bears. "So having some depth, I'm going to give credit to [Bears general manager] Ryan [Pace] for going out and always having depth is great," Nagy said. Daniels apparently is ready to be a starter now after getting his first start Sunday in place of Kush. "He played a good game," Nagy said. "There were a couple things in there where he got a little bit off balance, but one of his strengths is being able to recover with leverage. A couple other times where he was pulling in the run game and had some thumpers where he was bringing it. "I thought overall in the pass game, the offensive line did an awesome job protecting. They did a really good job in giving green grass to Mitch [Trubisky]. And specifically [Daniels], I thought for being in there as much as he was, he did well." Nagy said regardless of whether Long can play, the plays called will not be impacted. "He's a big guy and he is very athletic, but for us as coaches we just keep going," Nagy said. "We call the same stuff. We don't change. That would really honestly probably be with everybody." Tight end Ben Braunecker is in the NFL concussion protocol after an injury suffered in Sunday's game. Braunecker's contribution has largely been on special teams. Outside linebacker Khalil Mack (ankle) and wide receiver Allen Robinson II (groin) remain day-to-day with their injuries. Nagy said it's likely the two will go through a similar process as last week in preparation for this Sunday's game in Buffalo. The two didn't practice last week until Friday, and then practiced only on a limited basis. Nagy said Mack's injury hadn't gotten worse for playing on it Oct. 21 against the Patriots. "We just wanted to make sure that for him, it was the right decision," Nagy said. "So if we put him out there, No. 1, is he going to make it any worse by doing that, No. 2 does he help our team, is he effective enough." The Bears are playing the Bills, another struggling AFC East team, but Nagy said the opponent doesn't get figured into the equation. "I don't really think it plays that much of a role because all these games, they count so much, and they're so hard," Nagy said. "You want to be able to put yourself in a situation -- trust me, we want Khalil Mack out there, right? We want Allen Robinson out there. They want to be out there. "But this is just part of the business that we have to make sure that we're doing what's best for both parties." Linebacker Leonard Floyd continued his sack drought. It stands at seven games without one. "My view of where he's at right now is he's flying around everywhere," Nagy said. "He is. Now, numbers-wise, production-wise, he doesn't have the sack or the sacks that everybody wants from a first-round pick. Trust me, he wants it, too. But what I want to focus on with him is just sometimes naturally you can start pressing and you try to do things and you probably overdo things. "He wants to be able to go out there and affect the quarterback as much as he can, but what I see on tape right now is somebody that's, he's doing different moves, he's pressuring the quarterback from the edge, he's trying to chase him down. He just hasn't had that sack or those sacks and they do come in bunches. Right now with being 7-8 weeks into the season, hopefully we can keep that thing going or at least get him going. Once you get that first one, hopefully those other ones start picking up. I'm more than fine with where he's at and he's a big part of this defense."